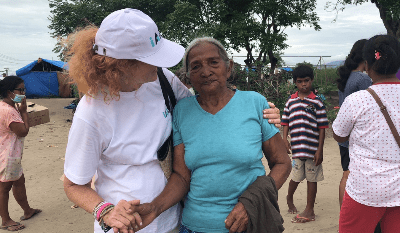 Sydney-based Alethea Gold is a global ambassador to iAID and has been co-ordinating humanitarian projects in disaster zones for several years. iAID is an Israeli-based specialist group of veteran humanitarian aid and tech experts with over 30 years experience in the field. Shachar Zahavi the founder came together with Alethea Gold and a passionate group of “tech” and “aid” experts and innovators to create life changing situations for victims of humanitarian disasters around the globe.Before joining the Israeli NGO iAID, Alethea spent 35 years being a fashion stylist and published three books to raise funds, The Children of South Africa, launched at the FIFA World Cup. Funds went to disadvantaged children to play sport. The Children of China launched at the Beijing Olympics, funds went to Aids affected orphans in China to allow them to go on summer camp and the Children of Israel for Ethiopian immigrant children to play sport in Israel. She also produced a documentary UNSUNG HEROES which raised enough money to take care of the unsung hero and her 28 children in the documentary for eight years. Alethea Gold has now been working alongside Shachar Zahavi for several years helping deal with many humanitarian issues around the world, including rescuing Afghanistan and Syrian refugees off boats in Lesbos, Greece and working with the Yazidi communities in camps in Northern Greece. She also worked with refugees undergoing music therapy in Berlin and recently took 10 refugees to meet pop icon STING at his concert. One of the refugees she took with her was a Jewish woman with two children from Iraq, who had escaped being sold to ISIS by her husband. Two years ago together Shachar and Alethea formed iAID with a group of friends to specialise in using innovative technology for humanitarian causes. 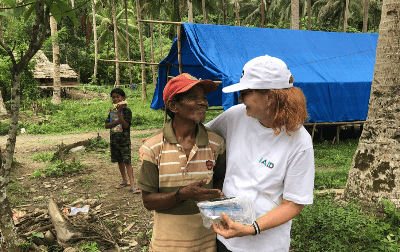 iAID have been supported by some amazing global corporations, among them DHL who have sponsored and delivered aid for them to disaster zones including Puerto Rico, Iraq and Indonesia. 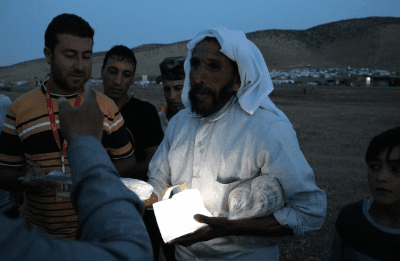 Alethea’s most recent project was delivering solar powered lanterns and water purifiers to the victims in the affected areas hit by the recent tsunami in Palu, Sulawesi in Indonesia. iAID were one of very few foreign NGO’s allowed to operate in the area. living in darkness for four years. Other communities including South Sudanese refugees in the Rhino Refugee Camp in Northern Uganda, refugee camps in Iraq, Puerto Rico and in Indonesia during the earthquake, tsunami and landslides have benefited from iAID. iAID are planning to help victims on the ground whose lives have been shattered by the recent cyclone Idai in Mozambique.